HOWEVER, it is not the Changes in the Sun’s heating “Irradiation” that causes changes in the Earth’s Temperatures, but instead, it is the Sun’s Solar Wind that blocks Cosmic Rays. The Sun’s Solar Wind follows directly with the “Irradiation”, so they are directly and closely correlated. When the Sun is active with sunspots and Irradiation, it blocks the Cosmic Rays that develop cloudiness on Earth and allows heating of the Earth’s surface and oceans. When the Sun is inactive, it allows the Cosmic Rays to pass and develop cloudiness on Earth to Cool it. Clouds transport vast amounts of heat into space by making rain and snow and reflecting 95% of the Suns heating radiation back into space. Clouds form when water evaporates into the air and the water vapor “Nucleaizes” into droplets as they rise into cooler altitudes. Cosmic Rays enhance “Nucleaization” similar to how atmospheric dust condenses water vapor. Here is the Tell-Tale chart on Solar Activity and Cosmic Rays. Water Vapor is 95% of the Earth’s Greenhouse Gasses. It acts more strongly than CO2 because CO2 cannot change to a liquid or solid at Earth’s temperatures and pressures, so CO2 has VERY limited ability to absorb or release heat compared to Water Vapor that can condense into water, releasing Vast amounts of heat, and then to Ice, releasing Vast more amounts of heat. When going from Ice to water to water vapor, it ABSORBS vast amounts of heat. CO2 cannot do any of this, and CO2 is only perhaps 3% of Earth’s greenhouse gasses. Water Vapor is a NEGATIVE FEEDBACK system in Earths atmosphere by pumping vast amounts of heat from the Surface to clouds to space. As the Sun is now in a low activity phase (the third declining cycle in a row, and now almost totally asleep), it cannot block the cosmic rays, so we should be seeing more cloudiness, more storms, and more heat being released into space, keeping the Earth from heating, perhaps even cooling it. See other blog posts here for even more details. According to researchers Theodor Landscheidt, Carl Smith and Geoff Sharp, the Sun may not wake up soon. If that happens, then we should be likely to see deadly cold beginning now and going on for as long as 50 years. Be afraid of Cold, not Heat. Go to Climate4you.com under the “Climate Reflections” tab on the Left hand side to Look at the temperature records and cloudiness and sunspots and cosmic rays for a fuller understanding of Climate Change and how it relates to Carbon Dioxide in Earth’s Atmosphere. Every single claim in the article is patently false, and the exact opposite of reality. 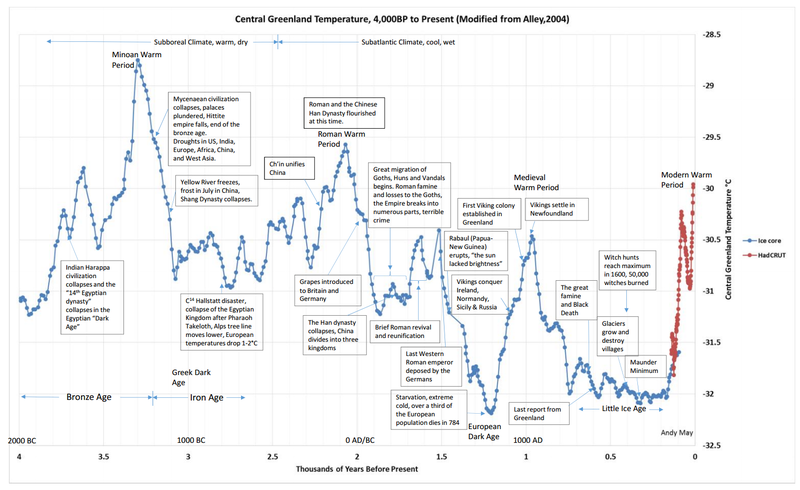 The authors intentionally started their study in a cold period, after the extreme heat of the 1930’s. Then they chose a baseline which included the coolest period on record, and declared the record cool to be normal. The EPA graph above is helpful, but isn’t very accurate. Summers were much hotter during the 1950’s, and heatwaves have been plummeting in frequency, intensity and duration over the past century.. 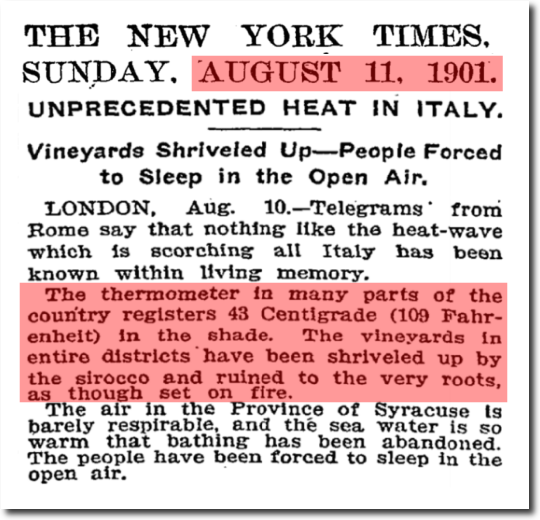 If New York Times writers actually read the New York Times, they would have known that temperatures approaching 130 degrees occurred in Australia in 1896, including several days of 129 degrees in “proper shade” 500 miles west of Sydney. They would have known that New York also had a massive heatwave in 1896, another in 1901, and that California was 134 degrees in 1913. 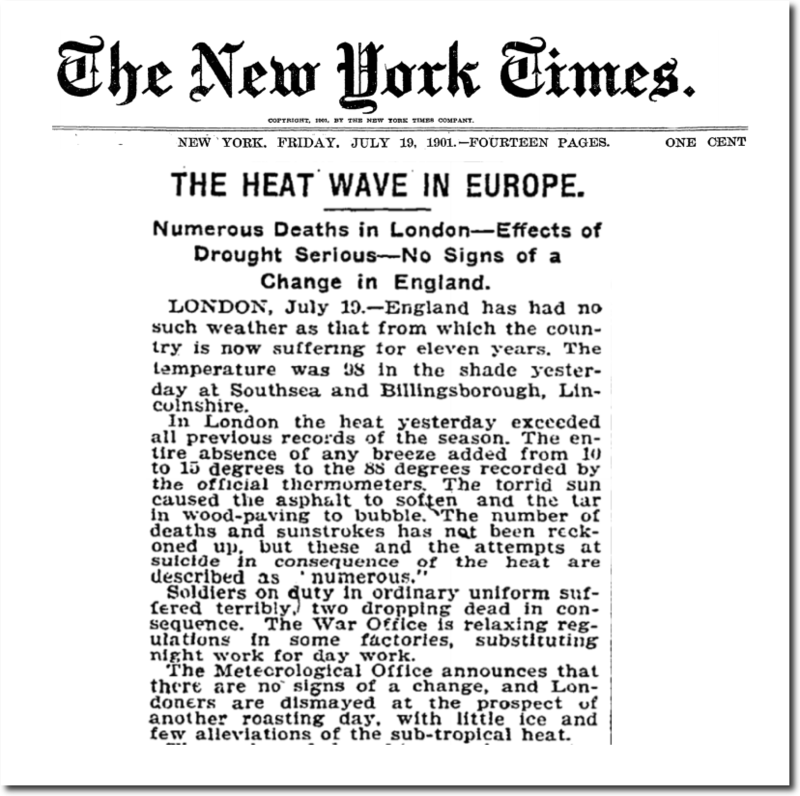 The New York Times headlines from the 1901 heatwave were quite remarkable. THE HEAT WAVE IN EUROPE. ; Numerous Deaths in London — Effects of Drought Serious — No Signs of a Change in England. UNPRECEDENTED HEAT IN ITALY. ; Vineyards Shriveled Up — People Forced to Sleep in the Open Air. The study quoted by the New York Times was written by James Hansen, who in 1999 knew perfectly well that the 1930’s and 1950’s were very hot, and that the US had been cooling since the 1930’s. If they would have read their own paper, they would have known that James Hansen is lying about 1950’s heatwaves, which were among the most severe in US history. Hansen’s transition to the dark side of climate fraud accelerated after 1999, when he started cooling the past and warming the present. Since Hansen retired, Gavin Schmidt has taken over as chief fraudster at NASA – further cooling the past and warming the present. Hansen also predicted that Lower Manhattan would drown between 2008 and 2018, and still believes it. It is unfortunate that current New York Times authors don’t do any research, don’t read their own paper, and simply parrot lies and idiocy from the same government funded frauds – over and over again. NOT THE HOTTEST YEARS LATELY! Don’t believe it! 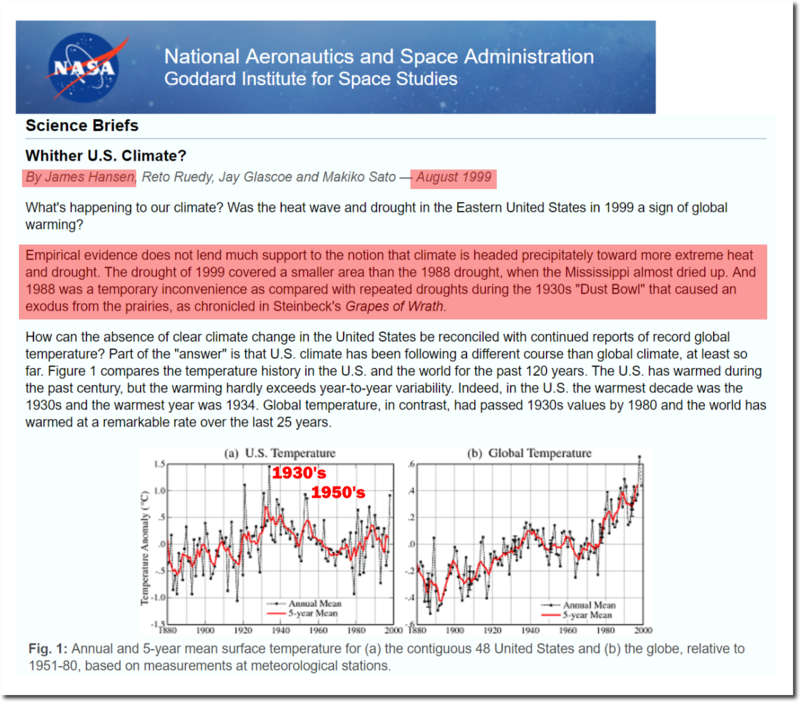 All US Warming, And Almost Half Of The Data, Is Faked to MAKE a Trend… PROOF! The details of how recent Global measurements prove Global Warming Climate Models are not working at all. These results clearly demonstrate — 13 times in fact — that once just the El Niño Southern Oscillation (ENSO) impacts on temperature data are accounted for by themselves, there is no “record setting” warming to be concerned about. 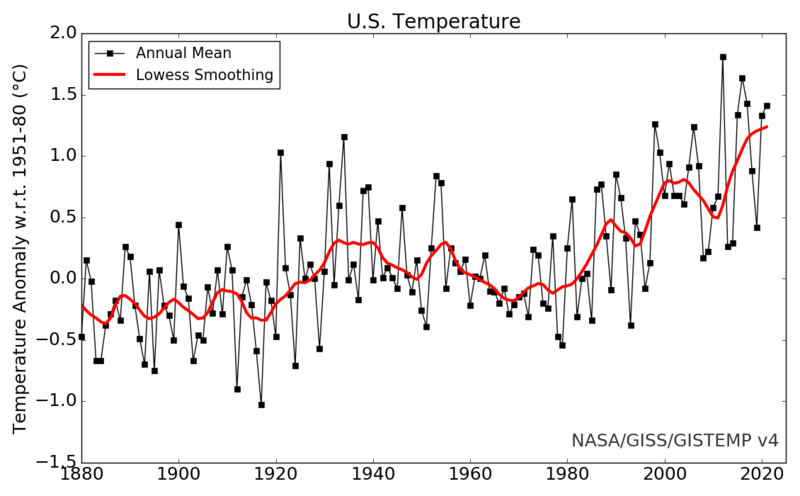 In fact, there is no ENSO-Adjusted Warming at all. These natural ENSO impacts involve both changes in solar activity and the 1977 Pacific Shift. From India… Cosmic Rays are Larger Influence on Earth’s Climate than Humans by making Cloudiness Globally. Scientists in India make it clear that cosmic Rays are a far bigger influence on Earth’s Climate than Humans. Cosmic rays make clouds that reflect 90% of the Sun’s heating Radiation from their top surface. Since The Earth is shielded from Cosmic Rays by the Sun’s Solar wind, an active Sun means a warm Earth and an Inactive Sun means a Cold cloudy Earth. It is not the very small variation in Solar Irradiance that does it. It is the large variation in solar mass ejections as measured by Sunspots that does it. This fooled IPCC climate models into discounting the Sun’s effect in favor of Carbon Dioxide. Also, When the Water cycle is included in Earth Climate models, the vast heat transfers from water changing states to Vapor or Ice dominate. The Water cycle was also left out of IPCC climate models as being “Too Complicated”. This article and its references address the powerful effect of Cosmic Rays. The Media is finally seeing the truth about Global Warming… The SUN INDIRECTLY controls the Earth’s Climate, NOT Humans or Carbon Dioxide. The Daily Mail is getting the scoop on the BIGGEST STORY OF THE CENTURY. We are already tipping into a mini ice age that may last 30 to 50 years. We have recently experienced days of no sunspots. This happened in the 1600’s, and the Earth Cooled to Deadly Cold as it clouded over. See other articles in Paullitely.com for all the details on how the Earth’s Climate is subject to the Sun’s activity, not Human Activity.